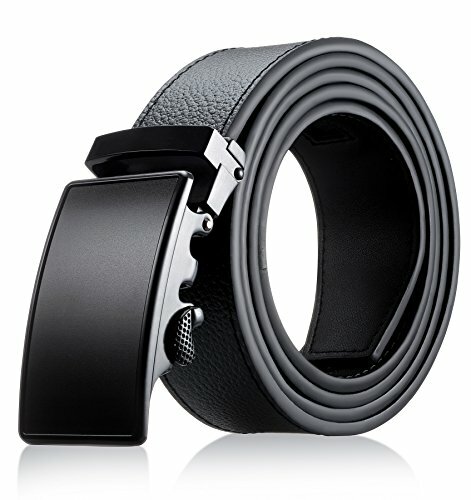 Men's Genuine Leather Belt- Ratchet Black Dress Belt for Men with Automatic Buckle. (Up to Size 46, Black belt with Buckle #01) by Upella at SCRHI. MPN: 43235-172537. Hurry! Limited time offer. Offer valid only while supplies last. SLIDE MECHANISM: No holes. No pushing. No pulling. Just slide belt into buckle & pull through. Upella buckle simply auto-locks the belt. To release, just gently push the lever. DESIGN: Leather strap is 11/8" wide with complementary designer buckle. Stylish sleek design. Get from the best leather belts for men out there. DURABILITY: The Upella ratchet belt is crafted from genuine quality leather and complimented with a scratch-resistant elegant buckle. Highest Quality Men leather belts. GIFT PACKAGING: Each belt is enclosed in elegant gift box. Get the full UPELLA signature look. THE UPELLA PROMISE: 100% MoneyBack Guarantee. No questions asked. Experience the UPELLA customer service. If you have any questions about this product by Upella, contact us by completing and submitting the form below. If you are looking for a specif part number, please include it with your message.